Head to nearly any health blog or website, and you can find everyone from enthusiasts to experts avidly proclaiming the benefits of superfoods. There’s a lot of hype around these nutritionally packed delicacies, but are they really all they’re cracked up to be? With such strong benefits to the human body, it’s easy to see why superfoods garner so much attention from health and nutritional experts. Plus, they’re easy to add into your diet! Chances are that you’re already eating some of these delicious foods but never knew that they were packed full of nutrients. While you might not enjoy the taste of all superfoods, there are more than enough to choose from and still create a healthy, balanced diet. Here is the best of the best! It isn’t just blueberries, though. Adding any type of berry into your diet brings several of the same benefits. Fresh strawberries and cranberries contain the same flavonoids found in blueberries, so chow down on these delicious fruits! Branching away from berries and into the realm of fruits rich in Vitamin C, Kiwifruit tends to stand out amongst the rest with a broader range of nutrients than melons or pears. These fuzzy brown powerhouses contain a surplus of Vitamins A, K, E, and B along with a high fiber content. Each kiwi is also packed with potassium, copper, folate, and serotonin. Some studies have suggested that eating this fruit on a regular basis is beneficial for a good night’s sleep, helping anyone who suffers from sleep disorders. Looking to lose weight, lower cholesterol, and eat healthy all at the same time? Then add a half cup of beans to your diet three times a week. You can choose anything from kidney to black beans and chick peas while still reaping all of the benefits. What can these legumes do for you? If you happen to have a foodborne allergy, check with your doctor to see which legumes you can eat. Since the term is broad, chances are that there is a bean out there perfect for your diet. Unlike refined grains, whole variants still contain the nutrient-rich bran and germ that make up their complexion. They’ll give you most of the same benefits found in beans and other legumes, but do not contain the same levels of protein. To make up for this, whole grains are rich in magnesium and fiber. Often considered a grain, Quinoa is actually a seed packed full of everything your body needs. This one gets its own category with a high protein content, tons of fiber and minerals, and plenty of antioxidant goodness. The greener the veggie, the more nutrients it contains. When it comes to vegetables, Kale often gets the most recognition out of the bunch. However, you can add any dark, leafy green to your diet and expect many of the same benefits. All of these dark veggies are packed full of Vitamins A, C, E and K. Some, like bok choy and broccoli, are also rich in B vitamins. All of these hearty foods come complete with high levels of iron, fiber, and magnesium. When picking out greens from the grocery store, make sure to skip the iceberg lettuce. Try Swiss chard, collards, or spinach instead. Anything within the mustard family is also an excellent source of nutrients. Different varieties offer different benefits, which means you can mix all kinds into your diet for a tasty and healthy variety. Lovers of organic produce can head over to their favorite farmer’s market to find seasonal squashes all year round. Omega 3 fatty acids have been shown to drastically aid the heart in its functions while warding off disease. Mackerel, trout, tuna, and salmon are all packed full of this vital nutrient, but you don’t have to consume an animal to get your daily dose. Skip the mercury content and inhuman practices by opting for a vegan alternative. Dozens of companies sell Omega 3 DHA in capsule form, all without the fish oil. It’s a win-win situation for wildlife and your heart! You know about super fruits. You hear another exotic name pop up every year from acai to goji berries. While the buzz around this year’s top fruit may seem larger than life, they do contain a rich amount of nutrients. On the downside, they tend to come with that “fruit of the year” price tag. If an overly priced pomegranate isn’t your cup of tea, then stick with the berries mentioned at the beginning of this list. There isn’t a berry out these that hasn’t shared the same healthy vitamins and minerals as these hyped-up fruits. Either way, you can rest assured that these are filled to the brim with nutrients your body needs. While you might think to yourself, “Hey, I can eat as much of these superfoods as I want!” the truth is that moderation is still just as important. Ideally, you should find about 5 superfoods that cover your nutritional needs and add them to your diet. This ensures that your body gets the nutrients it craves, but also keeps you from eating too much. Unfortunately, people can still gain weight from overeating healthy foods. You also want to separate real health superfoods from those overly processed and filled with sugars. Green tea and instant oats are excellent examples. While both contain a ton of nutrients, the process used to make them store ready cuts out the important parts of the plants.Try to stay as organic as possible when purchasing superfoods, especially grains and seeds. 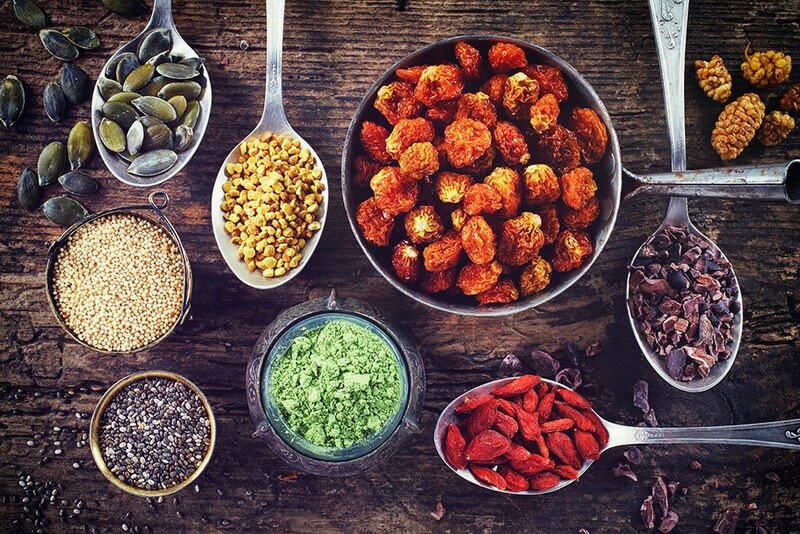 By adding these amazing superfoods to your diet, you can enjoy a healthy life while experiencing all the benefits of a well-maintained body and mind!